A total of ten chronographs from eight producers were tested against these criteria. The chronographs were placed one after the other, see table at bottom of post for sequence. 30 shots .308 Win and 10 of .223 Rem were fired during the test. Before we can say anything about these deviations we need to check whether they are consistent over the two shot series. 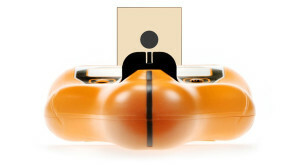 We know that you have to set the SuperChrono up meticously and open the Precision calculator to check for aiming errors. 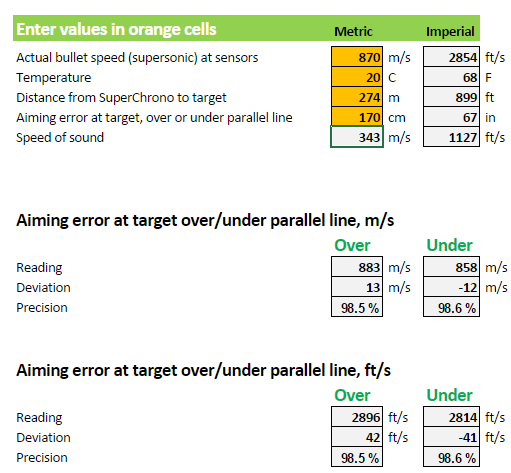 This is a spreadsheet with formulas taking into account the effects bullet velocity, speed of sound, angles and the distance between sensors. The input to the formulas are the orange fields shown in the screenshots below. Page 240 tells us that shooting distance was 300 yards, 274m, and enter this value along with the velocity of 870 m/s for the first string. We estimate the temperature to be 20C. 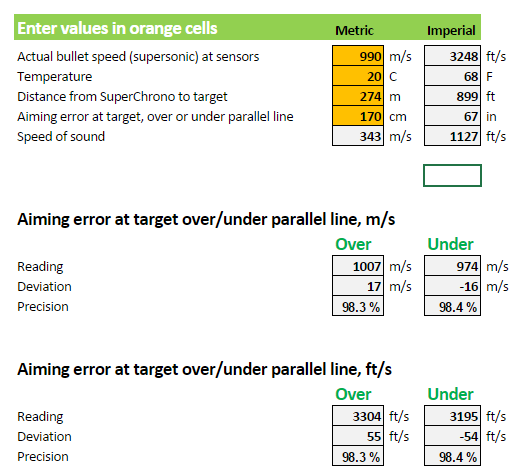 We enter values in the field “Aiming error at target, over or under parallel line” until the deviation in ft/s is 41. We arrive at 170cm of aiming error. 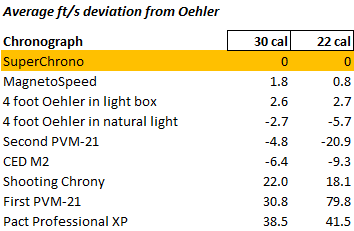 The corrected table shows the SuperChrono as the most accurate chronograph and with the same average velocity as the 12 foot Oehler. 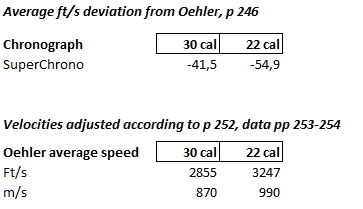 The table referred to on page 246 addresses deviations from the 12 foot Oehler. 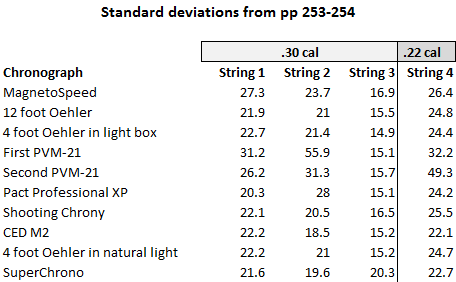 To check for overall precision we turn to the data tables and the standard deviations derived from the shot strings. The following table has been constructed from the data on pages 253-254. The SD for String 1 for MagnetoSpeed is higher than in the book. The number shown here is the one calculated by Excel. Conclusion: The most precise chronograph is the CED M2 with the SuperChrono in third place. What’s surprising from the SD tables is the poor performance of the two PVM-21. This is the established European and arguably the World’s reference chronograph. Its velocity readings have been verified by high-speed camera. Leading German shooting magazines such as Visier and Caliber use it to test ammo and guns in every issue. We at Steinert Sensing Systems have used it ourselves and find it inconceivable that it doesn’t perform at the very top in this test.